Tell people you are off to Colombia and the first words uttered are usually: “Is it safe?” and “Narcos”. And to be honest, Colombia has had its fair share of bad press given that for decades the country was torn apart by a drugs war and conflicts with leftist groups. But thanks to its wonderful and passionate people and the sheer force of the collective, this vibrant country has undergone a complete makeover and is definitely in the midst of a new era in its history. Travel to Colombia today is safe and rewarding and the country has one of the most stable economies in Latin America. I recently travelled to Colombia with my fabulous ground partner and I was struck by the sheer diversity on offer. There’s the country’s natural physical beauty from the dramatic Andes, lush rainforests and rolling hills of the coffee region to the tropical beaches which span both the Caribbean and Pacific oceans. History buffs will revel in the archaeological ruins of ancient pre-Columbian civilizations and how about a once in a lifetime helicopter trip above the terraces of Ciudad Perdida (The Lost City), a place hidden in the jungle for over 1000 years? Then there are the pretty colonial towns and the major cities which are experiencing a renaissance in food, culture and art. I can guarantee that any trip to Colombia will not leave you bored. Over the next couple of months I will share with you the incredible diversity Colombia has to offer. This month it’s all about the vibrant towns and cities, which changed my perception of the country. A trip to Colombia is likely to start in Bogotá the lively capital, which is well worth a couple of nights. I was really taken by the place. Split into different neighbourhoods, each area has something unique to offer. I was charmed by the colonial district of La Candeleria where I found pastel painted houses wedged between baroque churches and Art Deco buildings as well as the 16th Century Plaza de Bolivar where much of the country’s history has been lived out. Early one morning I was taken around the Paloquemao market with a local chef to sample the multitude of fruits and vegetables Colombia has to offer, which I then enjoyed on a street food tour around Usaquen, a laid-back residential area which is also home to one of the best flea-markets in town. In the trendy San Felipe district I explored the up and coming modern art scene with a private gallery viewing. And, if you happen to be in town on a Sunday, you must get up early and discover Bogotá like a true Bogotáno and join the Ciclovía, when the city closes around 75 miles of the streets to regular traffic and instead opens it up to bikers, runners, skaters and walkers. Evenings, like there were with me, will almost definitely be spent sampling some of the fabulous restaurants that the city is now becoming well known for. 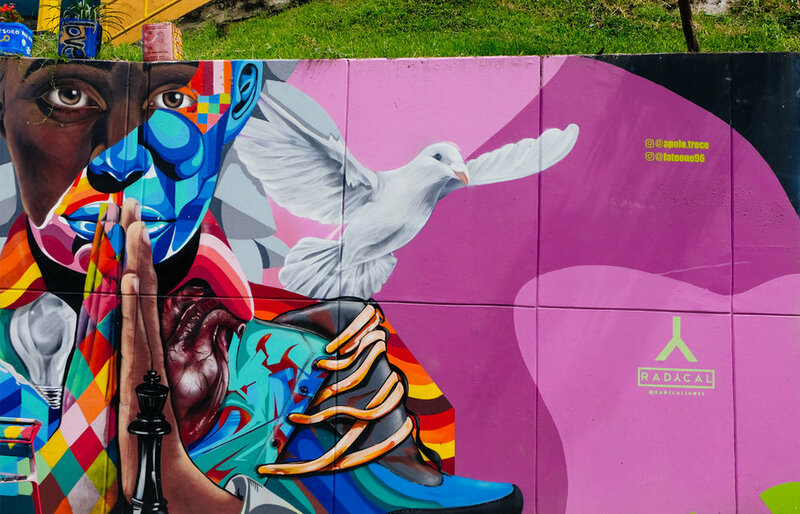 Once the centre of Colombia’s drugs trade, and home to the infamous Pablo Escobar, Medellín is now a beacon of social regeneration, thanks in part to the visionary policies of its Mayor. This city has left its drug-related violence in the past and post cartel it’s a fabulous city; a creative hub with cool shops and an amazing restaurant scene. But it was my trip to La Comuna 13 that blew me away. Once a no go shanty town in the hills overlooking Medellín, the higgledy-piggledy streets are now innovatively connected to the heart of the city by a series of escalators, which allow those that live there to hold down jobs. As I rode the escalators with my local guide, I learnt about the barrio’s complicated past, but also how art (in particular graffiti) and music have changed the look and feel of the neighbourhood as it gives a way for the younger generation to positively channel their energies into artistic expression. My guide proudly showed me some of his own graffiti before letting me try my hand at my own. Although definitely the most touristy of the places I visited on my trip, not helped by being a favourite stop for cruise ships, you cannot visit Colombia without spending some time in this colourful jewel on the Caribbean coast. As soon as you arrive you get a sense of the Afro-Caribbean influence in the food, music and the people. The immaculatly preserved 16th Century old town is quite rightly UNESCO listed. Ambling around the cobbled streets amongst pastel coloured houses strewn with bougainvillea is a delight….as too is the shopping. Then after dark, the bars open and the streets are filled with sultry music whilst innovative restaurants serve up delicious food. Chartering a speed boat and heading out to the Rosario Islands is the perfect way to spend a day. The islands are very popular and can get crowded, but in the hands of my ground partner we found secluded spots. There are also a handful of wonderful private villas that can be rented exclusively away from the crowds. A trip to Colombia offers everything you could want from culture to beach, to pretty colonial towns and amazing restaurants, hiking in lush rainforests, going out on horseback to spot wildlife or sitting and learning the traditions of indigenous communities. But what also makes the country so special is its inhabitants. Colombians are some of the warmest and most hospital people you will encounter and the country is alive with optimism and energy. For me, Colombia is (currently) one of South America’s best-kept secrets. The words out but the crowds haven’t arrived yet so it’s a great time to visit. If you’d like to find out more about a trip to Colombia, please do get in touch.